This article first appeared in The Edge Financial Daily, on January 30, 2018. KUALA LUMPUR: Inari Amertron Bhd, whose share price has been spiralling up in the past 12 months, has proposed a one-for-two bonus issuance to reward its shareholders. Shareholders of Inari are a well-rewarded lot. This is the third bonus issue that the semiconductor firm has had in three consecutive years. It had a one-for-one bonus issue in January 2017 and a one-for-four bonus issue in 2016, in addition to regular dividends declared. Inari declared a dividend per share of 8.6 sen in 2015, 8.4 sen in 2016 and 9.8 sen in 2017. Prior to that, however, the company made a cash call to raise fresh capital for expansion in 2013 and 2015. Within one year, Inari’s share price doubled from RM1.71 on Jan 31, 2017 to a record high of RM3.80 earlier this month. 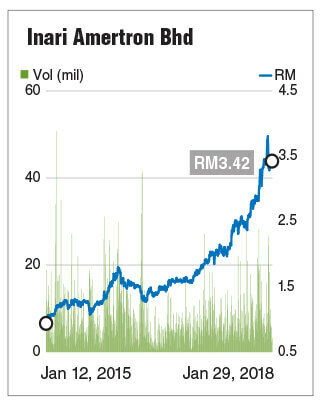 However, it has since retreated, closing 0.29% or one sen lower yesterday at RM3.42, with a market value of RM7.05 billion. In a filing with Bursa Malaysia yesterday, Inari said the bonus shares will be credited as fully paid-up at 10 sen per share to entitled shareholders, on an entitlement date to be determined later. The proposed bonus issue, according to Inari, will see Inari capitalising up to RM112.08 million from its share premium account. Following the exercise, Inari expects — under a minimum scenario — its share base to expand from 2.06 billion to 3.27 billion and its share capital to increase from RM556.48 million to RM912.71 million. Under a maximum scenario, the group’s share base could grow from 2.24 billion to 3.36 billion, with its share capital remaining unchanged at RM912.71 million.